The process of pizza dough preparation starts 2-3 days in advance when our unique blend of Italian and American flours ( Caputo “00” and Giusto’s Peak Performer organic flours ) are mixed together with water, salt , organic olive oil and a small part of “Pasta Madre” or starter which includes yeast. When the dough is ready, it is then divided in “Panetti” or pizza balls as seen above. As for the ingredients used in preparation , we have selected some of the best purveyors of Italian products on the market such as Italfoods and Chef Warehouse. In particular we have a fine selection of salumi and mozzarella di bufala which we also sell separately on our menu . As for vegetables , we intend to use local farms such as Happy Boys and Route 1 farms to provide us with the freshest produce. Sandro Costanza who comes from the region of Calabria in southern Italy has perfected that craft over the years, working his way as chef and pizzaiolo in various restaurants both in Europe and the US. 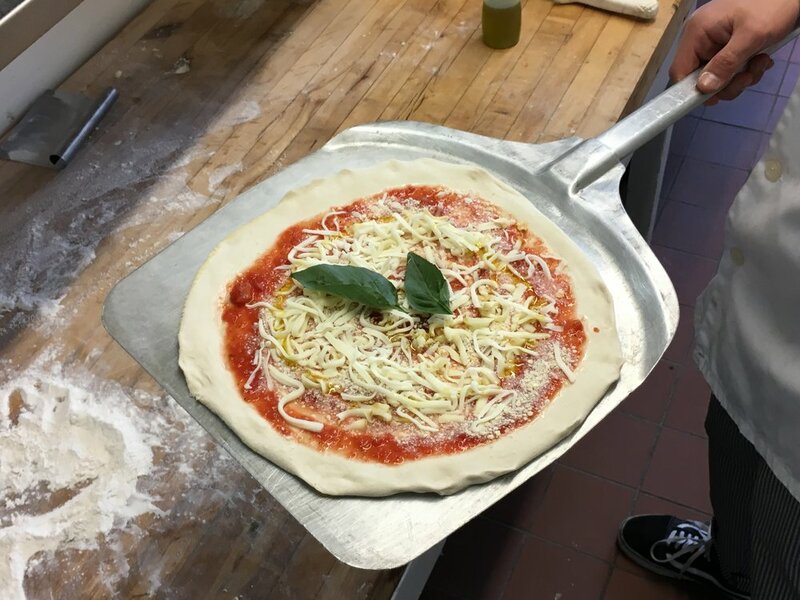 Through these experiences he was able to learn the secrets and various aspects and styles of pizza crafting.